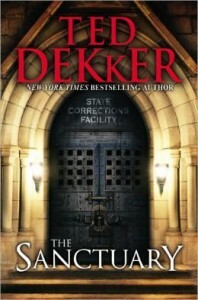 The Sanctuary is a novel about a correctional facility that has been given free reign to rehabilitate convicts without governmental or state regulations. The hero of the novel is Danny, a priest who turned vigilante when he felt the system failed him. His history made it possible to be very effective in this endeavor until he fell in love with Renee. She found herself needing to take justice upon herself as well but not as successfully as Danny and he takes the blame for her. Danny then finds himself in the Sanctuary and is faced with events that don’t seem possible in this day and age. Outside Renee is faced with solving the puzzle of how Danny was placed in the Sanctuary and to what ends. Someone went to great lengths to get him there. Is it revenge for Danny’s past or is someone punishing Renee? I must admit there was a moment in this book that took me by surprise. Not many stories do that anymore, but my jaw did drop at one point. Other than that I did not care much for this particular book. The storyline was not believable and the connection between the main characters was way too sappy for me. Dekker did not convince me that the world he was presenting could be happening or that the people he invented were real. I did finish the book to find out what happened, I just didn’t believe it.